As I pause this Thanksgiving week many thankful thoughts, like a mighty river overflowing its banks, flood over my soul and mind. I realize I am truly a blessed man. As I ponder all the Good Lord has allowed me to experience over my threescore and two years of living I could not be more thankful. Time or space will not allow me to mention all I am thankful for, but I will attempt to share some thankful thoughts. I have been blessed to proclaim the unsearchable riches of Christ for over forty-three years. I have had the privilege to pastor in five different North Carolina counties over the years, and am most thankful that for the past two-years to be interim pastor of the wonderful people of Salem Fork Baptist Church in Surry County. It is my earnest prayer that I can be half the blessing to them that they have been in my life. I can say of them, as Paul said of some of his friends, “For they have refreshed my spirit” (I Cor. 16:18). I am truly a blessed man. I have been more than privileged to help coach high school distance runners for over 40 years at six different schools in the areas where I have been privileged to pastor. I have always considered coaching an extension of my ministry that allows me to mentor many young people. There are no words in all the languages that exist on earth to express how grateful and thankful I am for the honor to have helped so many young people over the years. I have found you are more than a coach, but a father-figure, a mentor, a friend, a confidant, and an exemplar. There is no way to explain the joy and reward working with young people has brought to me. I have been blessed with so many wonderful memories I could never count them all. I am truly a blessed man. I am most thankful for the many prayers, kindness, and support I have received over the last year-and-a-half. Having been diagnosed with prostate cancer back in June of 2013, it has been an emotional and spiritual journey that has brought me closer to the Lord and, as well, made me appreciate more the preciousness of the gift of life and its blessings. The love, prayers, support, encouragement that I have experienced from so many people has been overwhelming and that, and the Good Lord, has been the reason I have done so well. I am truly a blessed man. I am thankful that after 50 years I am still running. I started running in junior high school and have been running ever since. I am, of course, not as fast as I once was, and grow slower with each passing year, but I truly express my thanks to the Good Lord each time I lace up my running shoes that He has blessed me with the health to continue to run daily. The clean feeling running gives to my soul is indescribable and always a looked forward to experience. And helps keep me sane! That I am still running after all these years I have never taken for granted, for I know each one could be my last one. I am truly a blessed man. I am the proud grandfather of three grandsons, ages nine, six, and a two years old. Living several states away, I don’t get to see them as often as I would like, but when I do there are no words to describe the inner joy that Wyatt, Tyler, and Levi bring to my soul. “Pa-pa” has taught them that when he is around no-matter the day of the week, it is “Toy-day” – as a trip to Wal-Mart results in toys for the boys. It is always a treasured experience that makes life worth the living. I am truly a blessed man. I am most thankful for the music of laughter. Can you think of anything more melodious than the laughter of a friend or love one? Laughter is a gift from God, it is natural and innate. It is contagious. Each time we hear a child laugh we are reminded that as we grow older not to lose this precious gift the Lord has given us. Laughter is the medicine that gives to our lives that balance in body, soul and mind, which helps us face the turbulence of day to day living. I love to laugh and each time I hear it lingering in the air about me I realize I am truly a blessed man. I am most thankful I am a Christian, though a most poor example of one. I am thankful that one night, many years ago, my heart was awakened to the truth that I am a sinner who had rebelled against a holy God. Yet, though a sinner, God’s holy-love provided for me a Savior, Jesus Christ, who paid my sin debt which He didn’t owe but that I could never pay. Embracing Him as Savior, I realize more each day how truly amazing His grace is. It is grace that saves me, keeps me, and will eternally sustain me. I am most grateful for the day He called me unto Himself. I am truly a blessed man. At Thanksgiving I am most thankful for the privilege of experiencing the blessings mentioned and many more too numerous to list. No matter how lengthy our list it would by no means ever be exhaustive, yet they are blessings that transcend the boundaries of time. We have much for which to be thankful. 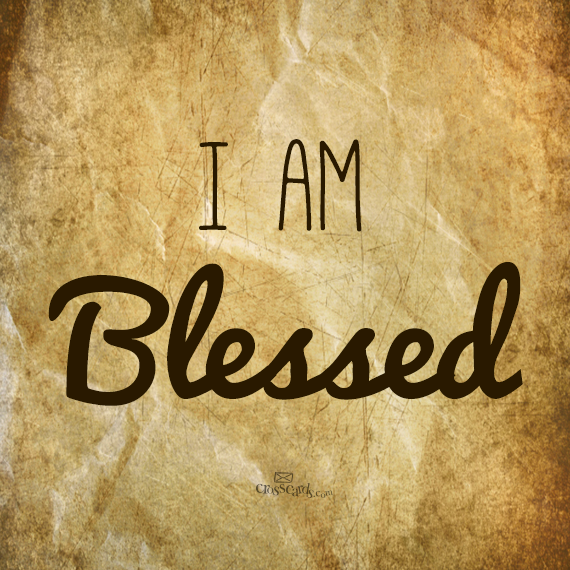 Our blessings are to be cherished. Our abundant blessings are to spur us to continually lift up hearts of thanksgiving for all we have received from the Lord’s hand. Did I mention that I am truly a blessed man?